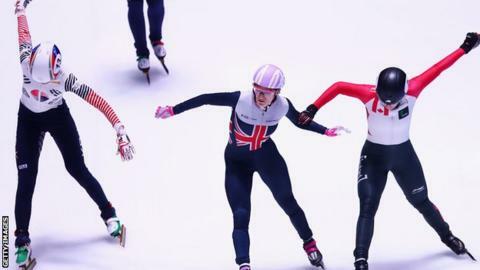 Elise Christie has become a triple world champion after victory in the 1000m, 1500m and the overall title at the World Short Track Speed Skating Championships in Rotterdam. On Saturday, she became the first British woman to win a world title when she took gold in the 1500m. And on Sunday the 26-year-old added a gold in the 1000m, bronze in the 3000m and claimed the overall title. The Scot had previously won eight world championship medals but never gold. "I was mainly focused on the 1000m, so winning the 1500m was a bonus for me, as I haven't raced that distance in so long," Christie said. "I don't think my competitors would have expected that either. "This year I have really changed my mindset, it was win or lose. I risked losing to win, taking each distance one at a time this weekend. "I have been physically capable for a long time, and I have shown I am mentally ready now." The world titles represent an impressive resurgence from Christie, who said she was considering her future in the sport after being disqualified from all three of her events at the Sochi 2014 Winter Olympics. Livingston-born Christie also finished fourth in the 500m final on Saturday. She has been focusing on the shorter distance events this season and had already set a new 500m world record of 42.335 seconds. Meanwhile at the World Freestyle Ski and Snowboard Championships, Zoe Gillings-Brier finished ninth in the snowboard cross. The Manxwoman only gave birth to a daughter last August and missed out on a chunk of pre-season training. Gillings-Brier, who does not receive UK Sport funding, told BBC Sport: "I loved every minute of it. Back on a big course with all the best competitors. Hopefully I'll get some great training in the summer." American Lindsey Jacobellis landed her fifth world title in a photo finish with France's Chloe Trespeuch. On her first appearance in the competition, 19-year-old Welsh competitor Maisie Potter went out in the snowboard cross quarter-finals.